In this paper, we will present a case of a 63-year-old female with bifrontal epidermoid tumor who has gone under bilateral craniotomy. In a case report study, a 63-year-old female with a chief complaint of progressive headache that has been admitted to Department of Neurosurgery was studied. 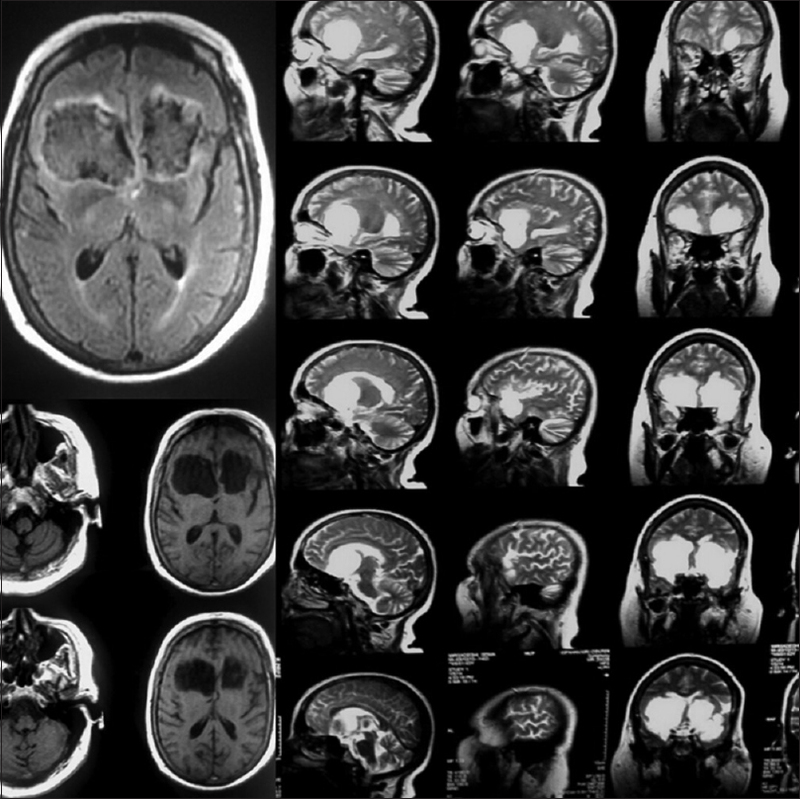 Magnetic resonance imaging was performed for better evaluation. After detection of bifrontal epidermoid cyst, the patient underwent surgery, and following the surgery, a cut of the tumor has been excised, sent for pathology sampling and reviewed for detection of cyst. Microscopic review of the resected part reported normal brain tissue along with sections containing parts of cyst wall covered by squamous epithelium and huge amount of irregularly stratified keratin within its lumen, which clearly emphasizes on diagnosis of a typical epidermoid tumor. Bifrontal epidermoid cyst is rare, and according to our study, the clinical symptoms and patients imaging were consistent with other studies. An intracranial epidermoid tumor is commonly a congenital benign rare tumor with a mesoectodermal origin, consisting a percentage of 1.8% of all space-occupying intracerebral lesions., They are also called as cholesteatomas and pearly tumors due to their pearl-like appearance. Any displacement of dorsal midline ectodermal cell during 4th and 5th weeks of embryogenesis period may lead to one of its kind. There might be different sites for the tumor. Cerebellopontine angle, paracellar region, supracellar chiasmatic, diploe and spinal canal and fourth ventricle are common sites of the tumor, from the most common to the very least., Multiple intracranial epidermoid tumors have been reported too rarely. In this paper, we will present a case of a 63-year-old female with bifrontal epidermoid tumor who has gone under bilateral craniotomy. A 63-year-old female with a chief complaint of a progressive headache has been admitted to the Department of Neurosurgery. The headache first has been presented 4 months ago. Before that time, the patient had always been symptom-free, following a normal active life. The pain was pulsating, with a concentration in frontal and periorbital area with no particular radiation. When severe, it has been followed by eye irritation and involuntary tearing. Headache was progressive along the day, and most severe at night. The severity of the pain has also been intensified within the recent weeks comparing to time it started. The patient had no history of seizure or convulsion, aphasia, and diplopia. Otherwise, she gave a history of occasional vomiting, nausea, amnesia, and sphincter dysfunction in form of stress incontinency and equilibrium problems. Cerebellar tests were abnormal, and she could not walk on her own. She had a history of left kidney tumor, for which she had undergone partial nephrectomy for about three years ago. Furthermore, she gave a history of controlled diabetes, hypertension, and hyperlipidemia. No history of ischemic heart disease or cerebrovascular attack was mentioned. She had a drug regimen of insulin, losartan, memantine, atorvastatin, zinc plus, magnesium, propranolol, and venlafaxine. In her physical examination, cranial nerves were intact, with a Glasgow Coma Scale of 15/15. Cerebellar tests were abnormal with obvious equilibrium dysfunction and inability to self-manage walk. Both pupils were normal sized, symmetric and reactive to light. Visual acuity was at level of finger count out of three meters distance. Sensory and motor function of the four extremities were normal; and no sensory level was detected. The patient suffered from sphincter dysfunction in the form of stress incontinency. Magnetic resonance imaging (MRI) was performed for better evaluation. In T1 view a well-defined hypo-signal mass was detected in middle gyrus of each frontal lobe. The same hyper signal mass was detected in T2 view. Two totally discrete heterogeneous intraparenchymal lesions in frontal lobes lateral to falx cerebri was detected in flair view. Slight marginal edema was also seen [Figure 1]. As surgical removal is choice in approach to epidermoid tumors, the patient then underwent bifrontal craniotomy. Bicoronal skin incision was made, and dura was separately opened on the left and right. Since there was no inspection of tumor beyond the cortex, two separate cortical incisions were also made and the two separate tumors were totally resected from the middle gyrus of frontal lobe of both hemispheres. Right after the surgery up to her last visit, the patient has become symptom-free. Following the surgery, a cut of the tumor has been excised, and sent for pathology sampling. 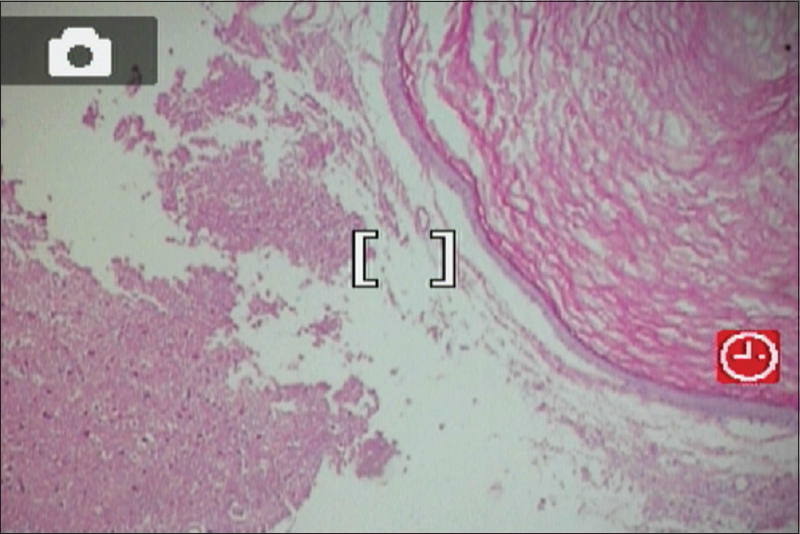 Microscopic review of the resected part reported normal brain tissue along with sections containing parts of cyst wall covered by squamous epithelium and huge amount of irregularly stratified keratin within its lumen which clearly emphasizes on diagnosis of a typical epidermoid tumor [Figure 2]. In the article above, we have tried to give a review of intracranial epidermoid tumors, their main characteristics, as well as the best approach to maximum life expectancy and quality for the patient. This case report mentioned a bifrontal epidermoid tumor, very rare condition that underwent surgery and we discussed its prognosis of surgery. Although radical resection can be followed by higher mortality and morbidity rate, particularly if the tumor is giant or adhered to tricky brain structures, partial removal could result in recurrence. Therefore, the decision is always left to surgeon's experience and qualification as well as the application of imaging and other possible radiologic methods to give a better insight of the very precise characteristics of the tumor in each and one case, which as every surgeon knows could be unique. Even if every possibility is considered beforehand, unpredicted new things can happen at the table of the surgery, something the neurosurgeon knows best. The authors have no financial interest and have not received any grants from an institute or organization for this study. Martin G, Netsky M.D. Epidermoid tumors, review of the literature. Surgical Neurology. 1988;29:477-83. Hsieh CH, Huang KM, Kao MC, Peng S, Wang CC. Hemorrhage in intracranial epidermoid cyst. J Formos Med Assoc 1996;95:173-5. Iaconetta G, Carvalho GA, Vorkapic P, Samii M. Intracerebral epidermoid tumor: A case report and review of the literature. Surg Neurol 2001;55:218-22. Ulivieri S, Oliveri G, Filosomi G, Miracco C. Intracranial epidermoid cyst: Case report. Ann Ital Chir 2008;79:445-6. Hossini A, Lakhdar F, Gana R, Maaqili MR, Saïdi A, Jiddane M, et al. Epidermoid cyst of the cisterna magna and the fourth ventricle: Report of four cases. Neurochirurgie 2012;58:358-63. Abedi E, Frable MA. Epidermoid cyst of the frontal bone masquerading as frontal sinusitis. Laryngoscope 1984;94:545-6. Albanese V, Tomasello F, Picozzi P, Sampaolo S, Spadaro A. Paramedian hourglass epidermoid extending above and below the tentorium. Surg Neurol 1982;18:356-63. Bostrom E. About the pale epidermids, dermoids, and lipomas and dural dermis. Path. und path. Zentralbl Pathol Anat 1897;8:1-98. Bailey P. Cruveilhiers tumeur perlees. Surg Gynecol Obstet 1920;31:390-401. Cushing H. A large epidermal cholesteatoma of the parieto-temporal region deforming the left hemisphere without cerebral symptoms. Surg Gynecol Obstet 1922;34:557-66.